You are here: HomenextTopicsnextEducationnextSherwood Hall School for Boys. 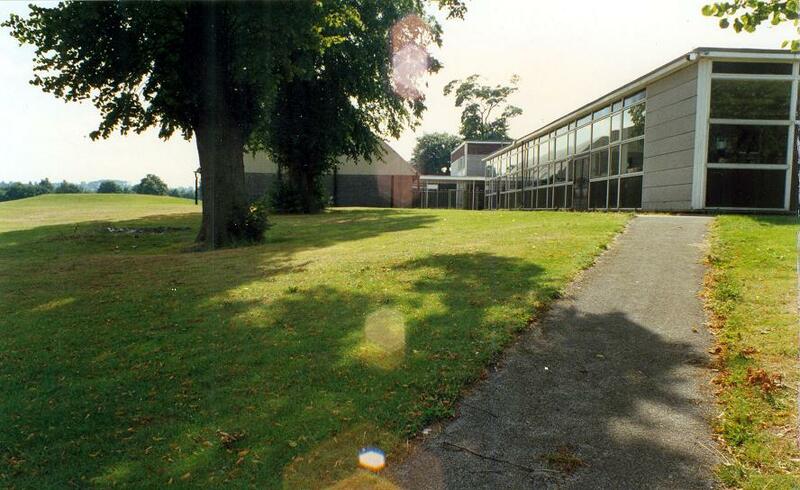 The three photographs of Sherwood Hall School were taken in 1989. The first shows the drive up to the main entrance doors, which in the 1960s opened up onto the assembly hall on the left, the reception slightly to the right, and the headmaster’s office to the right after a short flight of three or four steps. The block to the left of the picture catered to woodwork / metalwork. (I think it was woodwork this side and metalwork the other, with a courtyard in between). The block on the right of the photo was mostly sciences, and a small prefect’s room was also on the ground floor therein. The second photo is taken from an eastern viewpoint of the path alongside the art room, then the metalwork shop, before reaching the large “barn” behind those trees. In the 1960s this was a corrugated structure, used for games lessons when the weather was poor, and break times in general, when all the boys were expected to stand outdoors regardless of the weather and prefects would patrol the corridors to ensure we did so. 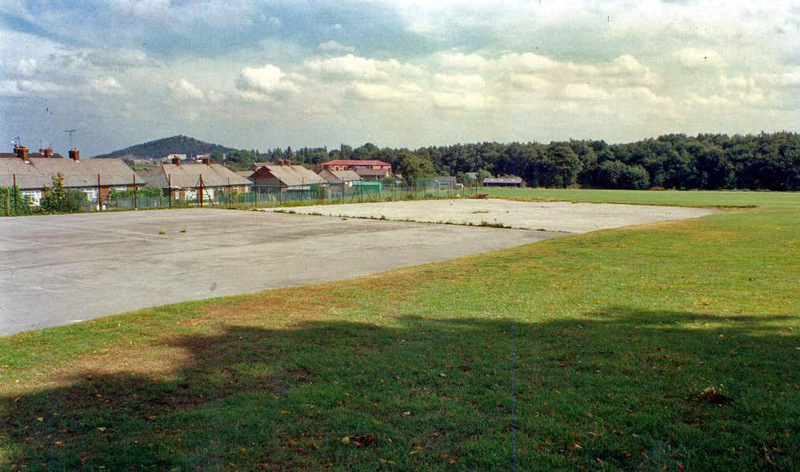 The third photo is of the tennis courts. 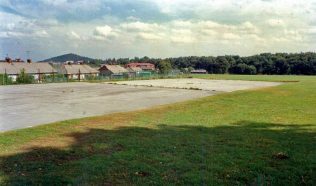 I think these were better fenced off in the 1960s, and the grassy bank across the centre of the picture was a favoured spot to sit in small groups and chat. 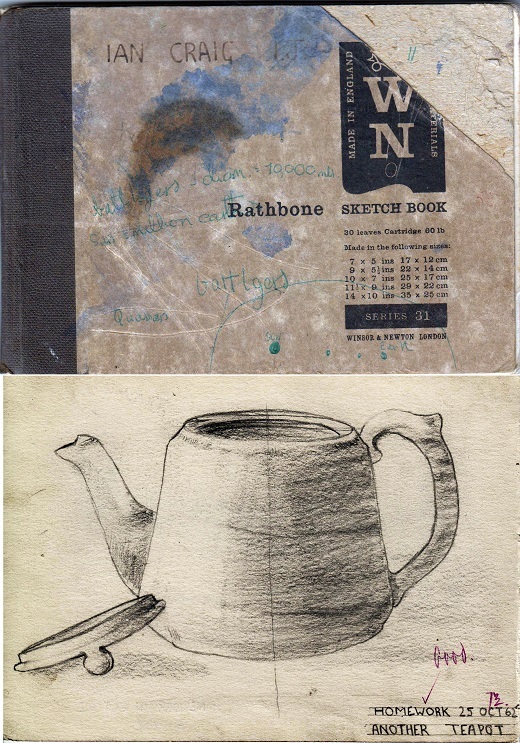 In the early 1960s you would have been issued with a small 7” x 5” sketchbook in which to do your art homework. Seen here is a typical homework task of the day. Mr Cook would teach us all how to construct an ellipse and shade a curved surface. We would then have to apply that knowledge to a designated object at home. 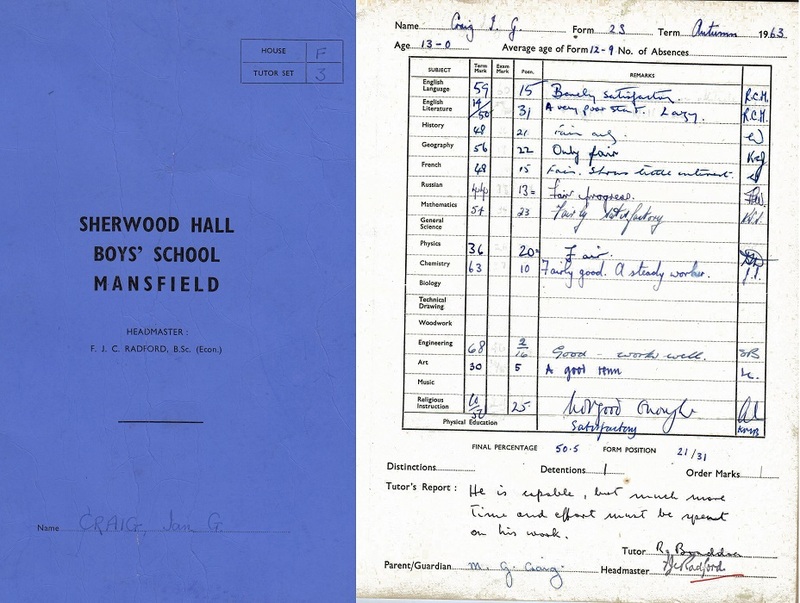 Mr Cook (“Cookie”) always marked homework in purple, the colour which always matched his tie. Classwork was similarly restrictive rather than expressive. He would give us a theme to go home and copy encyclopedia pictures for, then draught that same image out in class, add some lettering, and paint in using quality designer’s gouache. In the 1960s the main purpose of technical / grammar schools had less to do with “social mobility” (the current buzz phrase in 2016), and everything to do with finding draughtsmen, architects, engineers, etc. Pupil’s received three school reports a year: Spring, Summer & Autumn. (In the sixth form the cover changed to yellow.) On “report days” there were no lessons. We would sit in tutor groups for the day(s), reading in complete silence, whilst the tutor sat at the front writing reports for all his classes. These report books would then have to be circulated to other teachers as the day wore on, there being no detachable single sheets. Stereotypical comments such as “Satisfactory” or “Could do better” were commonplace, a practice teachers would never get away with today. Neither would “form position” be permitted now. I hope these pictures might be of use to people as time goes by. I was at the school between 1971 and 1976 and remember Mr Cooke as the art teacher. Also his son (Timothy) attended the school. Maybe my description isn’t too clear. The photo was taken in 1989. That spot was where the tennis courts were in 1962 – 68. I’m guessing the Stuart building you refer to (which was long after my time) was built on that spot after 1989. Hi Ian, I just want to say that I attended the Samworth Church Academy whist it was still within the Sherwood Hall buildings and the photo you say is the tennis courts is not actually the tennis courts, but it is where the Stuart building and the Barn was after it was burned down, the tennis courts were on the complete other side of the school near the Sherwood building right on the side of the main street. Hi David. I did see your Seeker post and made a comment. I think my cover must have been c.1966 / 67? When I was a teacher myself (West Bridgford) we were really careful to keep such extracurricular items safe. They give the full picture of a place. Sadly I imagine all that is gone. Best wishes. the block to the right also contained the room I sat in for Tech Drawing and I still remember drawing BSF threads, my career did not take me in that direction. The school in 1961 had been converted from a purely Technical one to one that had also had to teach a Grammar School curriculum. There was a distinct shortage of senior & Grammar schools at this time in Notts a situation which had been debated in The Commons by Don Concannon, Mansfield MP, so our school was set up to cover the gap. So the it was no surprise to see technical subjects given the emphasis they had. I stood outside in the weather those first years. In later years a group of us used to head into the toilet adjacent the barn and keep out the rest. Yes the tennis courts did have chain link fencing and depending on your school year you were allocated to a specific court. The prefects were on hand to make sure you kept to it. I see you kept your art book, so did I and I was useless. I recently took it into an art shop in Norwich (long story) and they were thoroughly amused at my pitiful attempts at a teapot, I got a detention of Mr Cook for it but I never improved. Only last week I found my school report and you are quite right that the comments were banal and unchanging year after year. I had forgotten that we had to sit in our Tutor Groups whilst the reports were written. 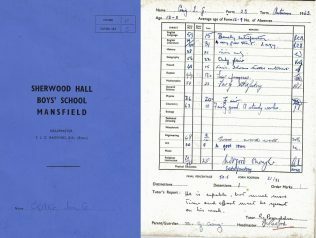 My form position was never high, I was a dedicated “low flyer” but the efforts of the teachers stood me in good stead. I posted front covers of “The Seeker” recently, will I find a contribution from you in there? Thanks for the post, if school pupils of today read our comments they must think we lived in an austere controlled environment – we didn’t.